Since its inception in 2008, Video MD used the innovative concept of creating free healthcare videos by doctors and physicians from various institutes and clinics, for the purpose of educating patients, and those connected to them, with detailed information on general health matters to complex procedures. Video MD upholds its reputation for excellence through careful review of all the medical content submitted, and a thorough screening process to confirm the credentials and identity of all healthcare providers. Since many of the contributors are the doctors known by the patients themselves, there is a high level of trust for the information presented in each video. But, for more complicated matters, preeminent specialists in a specific field of medicine are called on, so that you are guaranteed the most relevant knowledge in that field. With Video MD you make informed decisions regarding your health or that of your loved ones. Video MD needed an updated platform to provide video capabilities compatible with iPads and newer browsers, which previously was not possible. This site is now able to stream faster and display an array of searchable content features that is fully compatible and both comprehensive and easy to use. In addition to these regular features, this site needed to allow patients and families to create communities so that the patients themselves would bond and educate one another. Pulse built a new platform for VideoMD.com using ASP.Net 4.0 and SQL Server to develop a structure that fulfilled all of Video MD’s compatibility requirements. Pulse designed a simple, clean page layout that clearly displays the categories of conditions for easy reference and a fast keyword search which helps zero in on the required information without confusion. Easy navigation between communities and specific physicians that have contributed material ensures the comfort of the patients and a separate listing of the featured institutes increases the accessibility to specific videos. 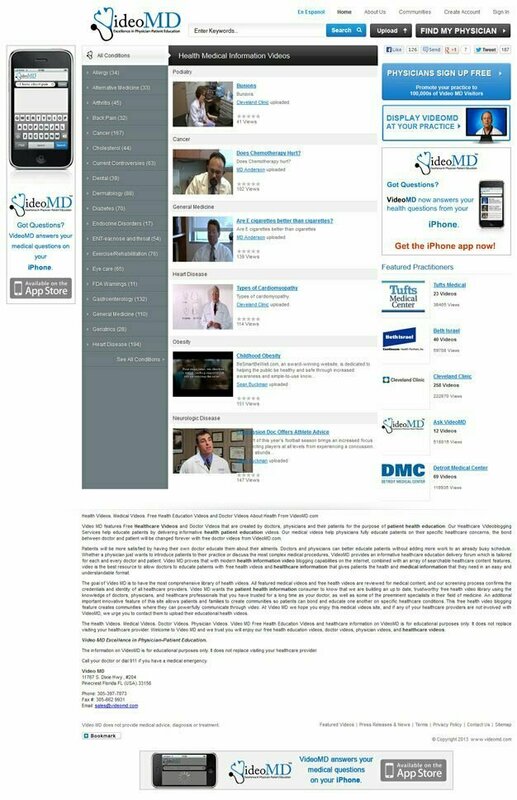 Video MD is now one of the fastest growing video sites available and has 2,500 participants. The site provides all the health information needed for seasoned professionals to students requiring concise explanation and new study material in an easy and understandable format. These online videos are an effective method for learning something new. Because of the comprehensive design of the VideoMD website, they can now reach out to many more institutes and increase the quality and amount of material available to both patients and physicians.